Every Tuesday I bring you a tip, trick, hint, and occasionally a tutorial. Well…today I give you one of my secrets in my arsenal of claying, the trick uses the very reasonably priced and easy to find Super Sculpey. Have you ever uttered these words after several hours of claying? I know that I have said that very often, especially after a long day sculpting in my studio. But I have a solution and a trick…Super Sculpey. Super Sculpey comes in Firm, Medium, & Original (shown above). The Original is my preference. Even Original Super Sculpey was once a very hard polymer clay. Somewhere in the past year the formula was changed or something happened. (Insert jumping for joy movement here). It is now a medium hardness consistency that allows for easier malleability. I have found this to be an utter joy in my studio. It is now my best studio friend and is ALWAYS on my work table. Have rock hard clay? Add a little of this at a time, it will blend easily into your clay as well as begin to turn your harder clay, soft. Be sure to blend Super Sculpey COMPLETELY into your clay or your new clays will “moon” where it is unblended. Use it to extend the color of clay. Don’t have enough red? Add some Super Sculpey and although it may mute the color slightly, it will give you more overall clay to work with for your project. Use it to strengthen your clay (see notes below). Please note that when adding Super Sculpey to clay to add it in small amounts or the color of your blend will change to a more muted palette! Have you ever had a piece break? ACK! I hate it when that happens. I just spent hours creating something to have it crack and break on me. Drat! Super Sculpey is more of a sculpting clay medium than an artists clay (like the Premo I use). This means that it is going to bake up super tough and strong. And because you can sand, carve, and drill into it … this means it’s actually making your clay tougher in the process too. In almost ALL of my pieces, whether small or large, I add Super Sculpey into the color blends, just for some added strength. In many of my larger pieces, I add large amounts of Super Sculpey just to make my pieces stronger and more durable over time. 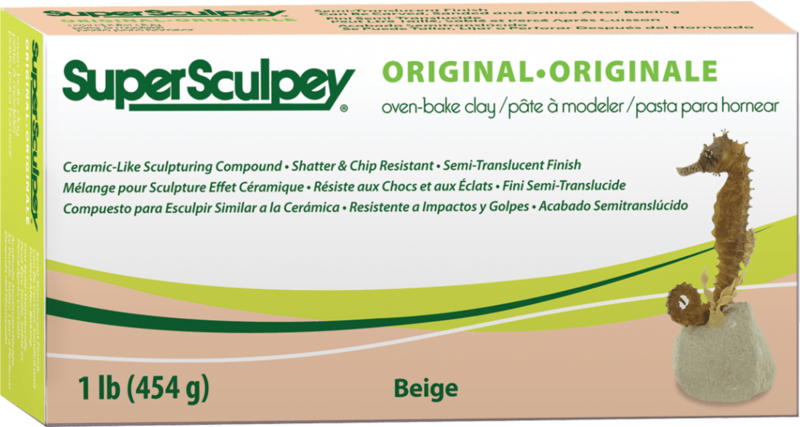 Do you use Super Sculpey? If you do, what do you use the polymer clay for? My sister makes her babies from 100% super sculpey. says it hardly needs kneading. Recently while having Mama’s apt cleaned 2″ little animals fell and broke in pieces. Large piece lost an arm. 1″ thick. Thought it would be rock hard.??? Like any other kind of polymer clay, it must be baked at the proper temperature and must be properly conditioned, despite it’s softness right out of the pack. Additionally, just like glass, porcelain, china, or earthen clay if it falls it may break despite taking proper care to condition the clay well and bake appropriately. I have never heard of this, but it is a great idea! Time to go shopping. Do you mix types of clay? What I mean is…do you add super sculpey to Premo? Yes, I do that all the time. The only clay I do not add Super Sculpey to is Kato clay, mostly because I have very little Kato clay and use it for my personal projects only.